Proper cleaning keeps wood floors looking new longer. Wood floors add warmth to any style of room, as well as help to keep allergies under control in damp climates where carpets may be susceptible to mold. Cleaning wood floors may seem daunting if you’re new to them, but don’t be intimidated. Most wood floors in the United States are made of oak, which is hard, sturdy wood that is very forgiving. With a little careful maintenance and prompt attention to mishaps and spills, your wood flooring can look new for years to come. Use a broom, dry static mop or soft-roller vacuum cleaner at least once a week to keep dust and grit from building up and causing fine scratches. Wood polish is not necessary, and can cause wood floors to become dangerously slippery. Clean overly soiled wood floors with a barely damp static mop or sponge mop. Clear water works well, and a splash of white vinegar added to a bucket of water is effective as long as you thoroughly wring out your mop or cleaning cloth. There are cleansers specifically formulated for wood floors, but they are not necessary if you regularly sweep or vacuum. Never soak a wood floor or use an abrasive or caustic cleanser. Abrasives can scratch wood floors and caustic cleansers such as ammonia can make the finish crack, peel or turn yellow. Start at the spot farthest from the door when mopping and work your way toward it to avoid walking on the damp wood floor. Blot or mop up all spills as soon as they happen to prevent staining. Remove greasy stains such as food or crayon marks with a clean, soft cloth barely dampened with mineral spirits. Rub away the spot with small circular motions, then buff it dry. Clean waxy or sticky stains such as lipstick or gum by filling a plastic zipper bag with ice, sealing it and applying it to the stain. When the stain freezes, it should be brittle enough to be carefully scraped away with a plastic kitchen spatula. 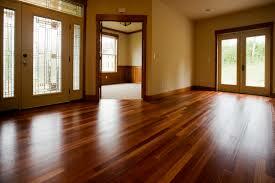 Do not use any type of abrasive cleanser on wood floors, because they can scratch the finish. Don’t despair if stains or sun damage changes the color of one area; in most cases, individual planks can be replaced without having to get an entire new floor. You are very welcome! Best wishes with your new home!